Green Mush™ is a pesticide free, whole food, green plant based combination. It is completely unlike traditional multi-vitamin/mineral products in that it is truly effective, totally non-toxic, and exceptionally absorbent with no toxicity (not settled out in the tissues as toxic deposits). There are absolutely no synthetics or isolated nutrients whatsoever in Green Mush™. The nutrients are exactly as they occur naturally in whole plant foods. They are fully recognizable and absorbent with NO toxicity! 100% Vegan and Cruelty Free! Suggested Use: Great for dogs, cats, rabbits, rats, guinea pigs, hamsters, mice, ferrets, squirrels, other mammals, and human animals, too! Mix approximately one part powder to one or two parts purified water, fresh juice, or fruit such as a banana (for flavoring) to make a mush. Small animals, like rats, can eat it this way as a meal. 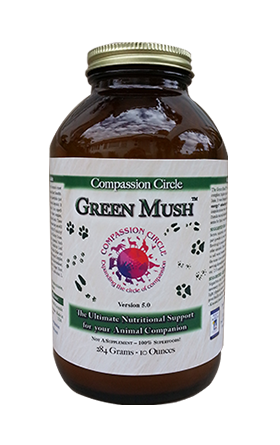 For other animals, Green Mush™ can be mixed into their normal foods (you may need to add water because Green Mush™ is a dry powder). Daily serving depends upon the size of the animal. *When feeding to cats on a vegan diet, add 1 teaspoon per day of cranberry powder to the diet to counter the alkalinity of Green Mush.™ Vitamin C or VegeYeast will also add acidity to the diet if those are preferred. It is safe to give cats 500 mg of Vitamin C per day. 2 teaspoons of VegeYeast per day will add B vitamins and acidity.